Ready to enable your account for OpenID access? Once you enable your Yahoo account for OpenID access, you can simply tell any OpenID enabled website that you are a Yahoo user. You will be sent to Yahoo to verify your Yahoo ID and password and then signed in to the website. Its that easy! You already enjoy a bunch of great services with your Yahoo account. The Yahoo OpenID service lets you take your account beyond Yahoo. Plus, the free Yahoo Sign-In Seal will help protect you from password theft, also known as phishing. Don't have a Yahoo ID? Sign up now. It only takes a couple of minutes. In a nutshell, the OpenID technology makes life simpler by having only one username and password to remember. Once you have enabled your Yahoo account for OpenID access, you only need to remember your Yahoo ID and password to use hundreds of websites... So bid farewell to password spreadsheets and stickies all over your desk! Bada bing, bada boom! It's that simple. When you are on a website that supports OpenID login, simply look for a Yahoo login button. Or if you see a text box with an OpenID icon, simply type in "yahoo.com". You will be sent to Yahoo to verify your Yahoo ID and password, and then you will be able to continue on. When using OpenID, you should not enter your Yahoo ID and password on any website other than Yahoo. If you haven't already done so, we strongly recommend setting up your free Yahoo sign-in seal. 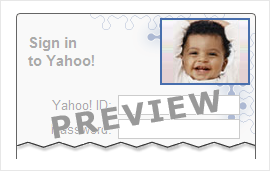 A sign-in seal is a personalized image or a message that will only appear on genuine Yahoo pages. To help prevent the bad guys on the Internet from stealing your Yahoo account data, always look for your sign-in seal before typing your Yahoo ID and password.